Re: 16 pole 4 phase model generator. This was my idea of winding. 16 stator windings grouped 4 in a series with twelve magnet poles. I can see it now and looks like you have done your homework also. The magnet oreitations are a nice touch. I need to study the magnet setup a little closer thought. Are you just going to rectifier the AC to use? To be honest, I did have the idea of putting the box fan back together and putting it all on the top of a tall pole in the back yard. Should be able to produce enough current to charge some NiMH batteries and maybe use them for some outdoor cement pathway lighting. When the wind blows that is. Very interesting project! 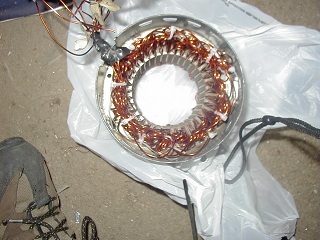 I have made many model generators but have never rewound stators. How is this project coming along? I think I see how the magnets and stator pole pairs work. At the point shown in your sketch, the N pole 1 is aligned with stator pole 1, S pole 4 with stator 5, N7 with stator 9, and S10 with stator 14, so you will get a voltage peak on the black winding (A) at this point (0 degrees). Then there will be N3, S6, N9, S12 for a peak on the green winding (B). Then S2, N5, S8, N11 for a peak on the blue winding (C). S12, N3, S6, N9 for a reverse peak on winding A. If I have understood this correctly, there will be four positive transitions followed by four negative transitions for each 1/4 turn, and four complete cycles per revolution. I actually made my own crude solid state three phase drive and was able to spin the motor using a 12V battery. But the MOSFETs were not properly rated and they released their "magic smoke".